OVERCOME is a wonderful word. It suggests that there are outcomes to the weighty issues of adversity that are pressing down upon you like an iron coat … an end to the dark scary valleys you’ve been slogging through … and that sometime soon you’re going to emerge from the darkness into a peaceful meadow of sunshine and joy. Valleys of adversity are challenges we all endure. No one escapes. We may look around and see others whom we think have avoided them, but truth be known—no one can. At one time or another, we all have financial woes, relationship upsets or tragedies. 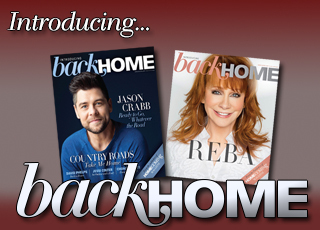 Our house burns down, someone robs us, or we get a terrible call about a loved one in crisis. 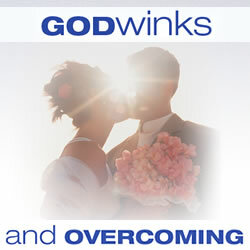 Sometimes called “coincidence,” Godwinks signal that you will overcome the disheartening situation you’re presently in. That was the case with Joy and Eric’s story. Joy was 22 years old and feeling euphoric. Her marriage to Eric Fellman was only two months off and she was the center of attention at her bridal shower in San Diego. She had no way of knowing that moments later she would receive the most devastating phone call of her life and everything would be turned upside down. In Milwaukee, doctors Louis Graber and Robert Isom were taking an early departure from a medical conference in order to make it back to Oshkosh, where they had hospital duty later in the day. They paused to read a sign announcing a lecture for an obscure medical procedure. The men simultaneously glanced at their watches, calculating their drive back home. “Think we have time for one more lecture?” asked Dr. Graber. His friend looked doubtful and shrugged. In Wisconsin, Eric Fellman was about to start his day. It was a lonely job, but it paid good money for a college senior on summer vacation: driving a contraption that sprayed weeds along miles of railroad tracks. And, he wanted to save up as much as he could before his upcoming wedding to Joy. Eric had just grabbed a quick breakfast from a diner near the railroad junction where he would mount the tracks with the odd-looking truck that could travel on both ground and rails. He turned the key. The machine groaned a grinding response, sputtered to a start, then quit. “It must be that darn starter cable,” he said, climbing down from the vehicle. On his back, he skittered under the large rollers that, when lowered, rode over the rails. He’d learned from previous experience that by reaching up from underneath, he could wiggle the faulty starter. Pop! A crackling noise. The cable holding the parking brake snapped! Then … the unimaginable! The machine lurched. The rollers that kept it on the tracks rolled over Eric. He was crushed! A lady passerby screamed. The owner of the diner quickly called 911. Soon Eric was lifted into an ambulance and rushed to the hospital. Worried doctors conferred on how to prevent the worst thing from happening—a burst liver, which in most cases, is fatal; a ruptured liver is almost impossible to suture. Then, the worst thing DID happen. His liver burst! Joy, shocked by the news, fell to her knees and cried out for God to save Eric. Her mind was swimming with confusion. How could she get to Oshkosh? Would he still be alive when she got there? She was overwhelmed. But God had a plan … to overcome. As the operating room team swiftly prepped Eric for surgery, he received the most powerful Godwink of his life. Two doctors entered the room: Dr. Louis Graber and Dr. Robert Isom, just back from Milwaukee. Taking command, they knew exactly what to do. They DID take in that last lecture. It was about a new operating technique on how to suture a ruptured liver. Within seconds, Dr. Graber deftly executed the newly-learned instructions. Eric’s liver was repaired! And his life was saved. With their wedding delayed only one month, Eric and Joy took their vows—Eric with an arm in a sling and his jaw wired shut—but, thanking God that they had been able to emerge from a dark valley of uncertainty, to overcome one of the most horrific crises of their lives. Thanks to one incredible Godwink. And, don’t we love the optimistic statement of that other great hymn, “We Shall Overcome.” It’s a bold affirmation that you, with God’s help, SHALL overcome! Not “maybe.” Not “if.” You SHALL overcome. Today Eric and Joy Fellman live in Texas, parents of three grown children. After several years working with the National Prayer Breakfast, Eric is President of Bible League International. 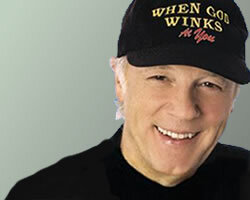 SQuire Rushnell is a former ABC Network Television executive, multiple Emmy Award winner, inspirational storyteller and bestselling author of the WHEN GOD WINKS book series.